We compare the two WordPresses to find the best builder for your business website. If you’ve done any research into website building, you’ve probably heard once or twice (or ten thousand times) that you should use WordPress to create your website. For all that WordPress.com and WordPress.org have in common (an awful lot, really), they do have some key differences that you need to understand. So the common advice to “just use WordPress” requires some further explaining. And that’s just what we’ll do in this article: clarify the differences between WordPress.com and WordPress.org and help you choose the right platform for your business website. Let’s get to the bottom of things. Before we get into the nitty-gritty of how WordPress.com and WordPress.org operate, let’s make sure everyone’s on the same page about what those two things even are and why they have the same name. WordPress.org is a free, open-source software that requires you to get a hosting provider. WordPress.com takes a version of that software and pairs it with web hosting for one convenient (paid) product. WordPress.org has been free and open-source since its release in 2003, so you don’t have to pay for the software. That said, WordPress.org only builds sites—it doesn’t host them—so you will need to pay for web hosting. A couple years after WordPress.org debuted, one of the original developers launched WordPress.com as an all-in-one WordPress solution. It combines a version of the WordPress.org software with web hosting as one bundled product. You can even get your domain through WordPress.com. WordPress.com offers several different paid plans to meet different website needs. It even offers a free plan, though your website’s URL will be a subdomain of WordPress.com ([yourbusinessname].wordpress.com) and the site will have WordPress ads on it. When we talk about WordPress.com, we’re talking about its Business plan unless otherwise specified. It’s the only plan we recommend, as the other plans lack vital features. See our WordPress review for more details. Once upon a time, WordPress.com offered an ultra-limited version of the WordPress.org software. Even with the best plans, you couldn’t add plugins to your site or upload custom themes—two of the defining features that popularized WordPress.org in the first place (more on those features later). If that was still the case, we’d just tell you to use WordPress.org and be done with it. But we live in the future, and WordPress.com now offers a Business plan that gives you all those features—like plugins, custom themes, and SEO capabilities. With that kind of plan, WordPress.com functions more or less like managed WordPress.org hosting (a common type of web hosting that takes care of the technical parts of the WordPress software—like keeping it updated to the latest version—for you). That makes choosing between WordPress.org and WordPress.com a whole lot harder. Now that you know the essential differences, let’s see how the pros and cons of the two WordPresses compare. By now you should know that the biggest difference between WordPress.com and WordPress.org (assuming you get WordPress.com’s best plan) comes down to hosting. WordPress.com is a builder and a web host, while WordPress.org requires you to get your own hosting. Aside from that, you might not notice a ton of differences. They’re both WordPress, after all. The site-building process will feel almost the same, and you can create an identical website with each platform. WordPress.com’s bundled building and hosting makes it a more convenient solution than its .org counterpart. After all, it puts everything in one place. You don’t have to find a web host for your website and then figure out how to use WordPress with that host. You can even get your domain through WordPress.com if you want. Plus, WordPress.com makes maintaining WordPress easy. WordPress.com manages your WordPress software for you, so you won’t have to update it to the latest version or patch it if there are problems. You just use the software. That means that WordPress.com gets most of the customization benefits of WordPress with less work on your part. WordPress.org gives you complete control over every part of your website—including your host—for a more personalized experience. For example, you might want to choose a dedicated host for your business (most hosting is shared hosting, so you share your server with other websites, but dedicated hosting gives you a private server). WordPress.org lets you do that. Likewise, there might be times where you want to keep running an older version of WordPress (though, to be clear, we don’t recommend that for security reasons), maybe because one of your plugins isn’t compatible with the newest version. With WordPress.org, you can update your version of WordPress when and if you want to. In other words, WordPress.org gives you more control over the back end of your website. Curious about common business website features? Here’s how WordPress.com and WordPress.org compare. Spoiler: they’re almost identical. As we alluded to above, both WordPresses give you e-commerce features in the form of plugins; you won’t find a built-in point-of-sale system or anything like that. So if you’re making an online store with either WordPress, you’ll need to find a plugin (or suite of plugins) that does what you want. For example, WooCommerce is a free plugin that lets you add an online store to your WordPress site. It lets you create product listings, take payments, track inventory, and more. You will have to pay for some of the more advanced e-commerce features (like creating add-ons like gift wrapping, getting shipping quotes from USPS and UPS, or customizing your checkout forms). If you’re not sold on WooCommerce, you can find other e-commerce plugins through the “Plugins” link on WordPress’s main menu (both .com and .org). As we’ve already stressed, you will need the Business plan to get plugins with WordPress.com. The Personal plan has absolutely no e-commerce features; the Premium plan lets you add a PayPal button. That might be enough if you sell only a few D&D portrait commissions every month, but most e-commerce businesses will want more powerful features available only via plugins. The two WordPresses use the same blogging platform, so you’ll get the exact same features with either .com or .org. Both will preserve the formatting on any text you paste in, for instance. 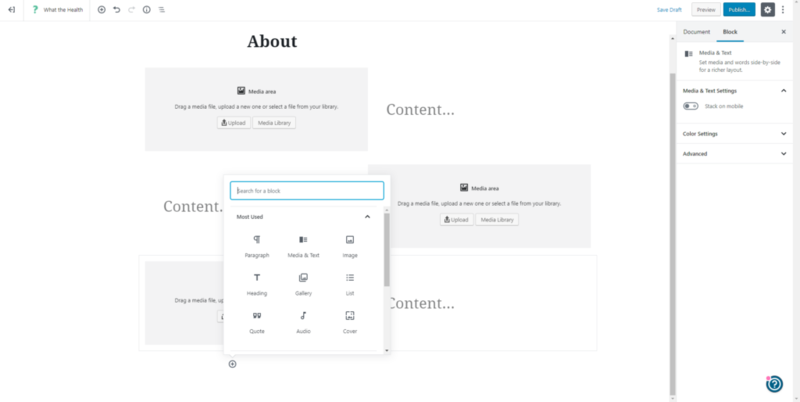 They’ll both allow you to organize your blog with categories and tags. Even the basic WordPress.com plans have the same blogging features. But the Business plan and WordPress.org both offer more advanced SEO tools, which help customers find your website via search engines. Some of those tools (like meta descriptions) come baked in; others (like XML sitemaps or breadcrumbs) require an app like Yoast to set up. You can install other plugins to enhance your blog content too. You might want to get a social sharing plugin, for example, so readers can easily share your latest recipe from your food blog on social media. Or you may want a plugin that generates pop-ups asking readers to subscribe so your mommy blog gets repeat visitors. With either WordPress.org or WordPress.com’s Business plan, you’ll have no problems creating a feature-rich blog. So how much will your WordPress of choice cost you? Good question. Some of the biggest differences between WordPress.com and WordPress.org come down to the pricing. WordPress.com has a simple pricing structure, so we’ll start with that. As we’ve noted throughout this piece, we exclusively recommend the Business plan. The Personal and Premium plans don’t let you use plugins or customize your website in the same way—and without those features, it’s hard to justify using WordPress with its notoriously steep learning curve. So back to the Business plan. While it costs more than double the other WordPress.com plans (which you shouldn’t use), its $25 per month cost is in line with popular builders like Wix or Squarespace and much cheaper than high-tier BigCommerce and Shopify plans. Remember, the cost of a WordPress.com plan includes the builder and hosting. So while you might pay for extras like plugins and themes (more on those in just a moment), you won’t find any hidden hosting costs with WordPress.com. But what about WordPress.org? As we’ve mentioned before, the software itself is free. You can download it and use it without paying a dime. You will need hosting, though, and that costs money. You can get hosting for your site from any number of web hosting providers, each of which has its own plans and pricing. For simplicity’s sake, we’ll take a look at hosting with Bluehost, our recommended WordPress host. As you can see, even the priciest Bluehost hosting plan costs less than WordPress.com’s Business plan. Sure, WordPress.com has cheaper plans, but again, those don’t get you all of WordPress’s features. Even the cheapest hosting plan with WordPress.org gets you access to CSS (cascading style sheets), plugins, and SEO features. The difference between the hosting plans mostly comes down to storage space (better plans have more storage space) and how many websites you can host. The basic plan lets you host one website with 25 subdomains; the more expensive plans let you host unlimited websites with unlimited subdomains. You also get automatic site backups with the Choice Plus plan. Keep in mind that you can often find killer deals on hosting. For example, Bluehost currently offers new customers Choice Plus hosting for just $5.95 per month. So you can get WordPress.org plus hosting for cheaper than you get WordPress.com’s Business plan. But WordPress.com does offer more convenience—you don’t have to find a host, you don’t have to wrangle with WordPress’s back end, and you get to have one login for your website. For some business owners, that convenience might be worth paying a little more. With either WordPress, you should consider other costs, like the price of a domain or premium plugins. Pretty much all small businesses should have a custom domain name. WordPress.com includes a free domain for one year when you sign up, and so does Bluehost. But after that free year, you’ll need to include the cost of a domain in your calculations. You can renew your domain through WordPress.com or your host, or you can transfer it to your favorite domain registrar. A standard .com or .org domain can cost you as little as $12 a year—or less, if you get it on sale—though some popular domains can cost much more. A newer domain suffix like .design can cost $40 or more. Likewise, you’ll probably want some plugins. While many popular plugins are free, some do cost money (or at least have paid upgrades). The cost of plugins varies wildly (from $1 to $1,000), so research your plugins ahead of time to estimate your cost. Then you’ve got themes. While you’ll find plenty of free WordPress themes, you may find that premium themes are worth the cost. 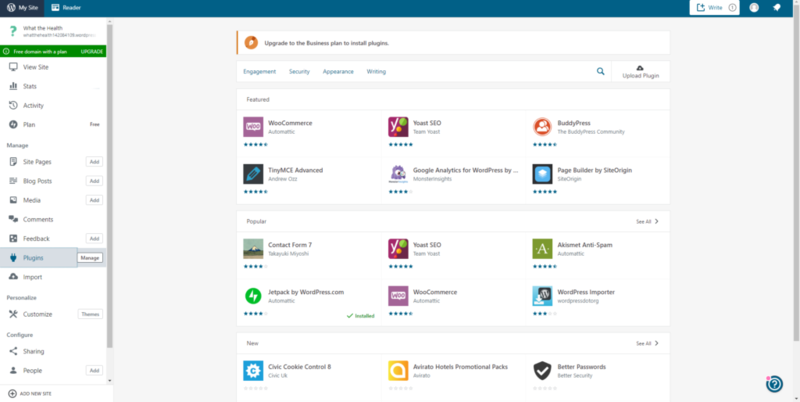 Paid themes often have layouts that are fine-tuned for certain types of businesses. For example, if you’re showing off your photography portfolio, you’ll want an image-heavy theme. If you have a gaming blog and you intend to monetize your site with ads, you’ll want a blogging theme that’s built to incorporate advertising. WordPress themes vary in price, but expect to pay around $60 on average.2 Most themes are a one-time purchase rather than a subscription. If you get WordPress.org with web hosting, you might also want to pay for some host-specific add-ons. Bluehost, for example, offers extras like additional site security (SiteLock for $29.99 a year), a dedicated IP address ($5.99 a month), and spam filtering (SpamExperts at $2.99 a month). Wondering about dedicated hosting? As you might recall, we mentioned that one reason you might choose WordPress.org is to get dedicated hosting for your website. As you’d expect, that kind of privacy will cost you. Again, here’s Bluehost. To be clear, you don’t need dedicated hosting for your four-page website about your brick-and-mortar store or for your church’s blog; only high-traffic websites need apply. And frankly, if you’re looking into dedicated hosting, you should also probably look into a web developer who can help you maximize the benefits of your hosting. Since this guide is for business owners building their own sites, that’s all we’ll say about dedicated hosting. How do the two WordPresses compare when you’re actually building a business website? We tested them both to find out. As you’d expect, the experience feels pretty similar, given that WordPress.com runs a version of the WordPress.org software. But we’ll point out a few things you might want to know. Before we get into usability, let’s pause to note that neither WordPress is going to win any awards for ease of use. If that’s your priority, you should probably skip both WordPresses and go with something like Wix instead. Pretty much identical, as you can see. They both let you use the exact same content blocks to assemble a page quickly. You have the same options for things like font size, image placement, etc. As a result, there’s no real difference in build time between the two. That being said, WordPress.com might feel a little simpler to use, if only because it features a simplified main menu with grouped options. WordPress.org has more options and less organization, which might be confusing when you first get started. But aside from that, we noticed no difference in building with WordPress.com vs. WordPress.org. WordPress.com offers 24/7 email and live chat customer support with its Business plan, as well as 24/5 support on its other paid plans. WordPress.org offers no formal customer support, though it does have community support forums. As long as you get the Business plan, WordPress.com and WordPress.org have functionally identical design features. As noted above, they use the same blocks to build pages, so your design options for any given page or blog post are the same for either builder. Both WordPresses allow you to customize your CSS (cascading style sheets) to fine-tune your website. And since you can upload custom themes, you can choose any theme you want for either WordPress. If you choose lower-tier plans on WordPress.com, you won’t be able to upload themes, which will limit your choices. The Personal plan doesn’t even let you customize your CSS. But with our recommended plan, WordPress.com and WordPress.org create equally beautiful pages. WordPress.org and WordPress.com also have virtually identical customization options. They both allow you to change your CSS or change your theme. 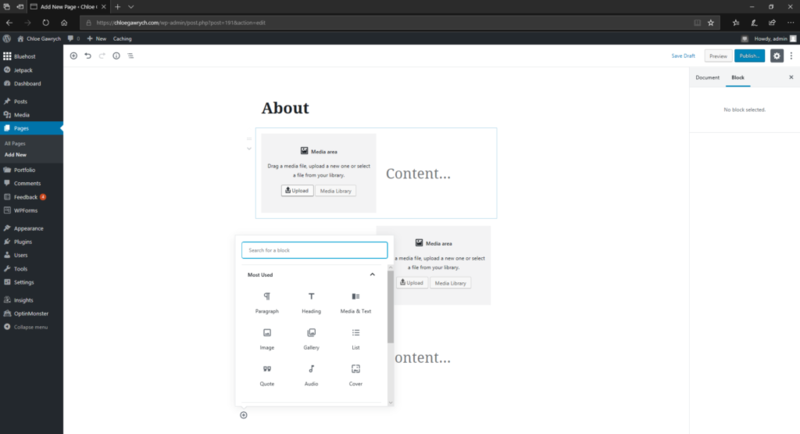 You can select a theme via the built-in theme stores with either WordPress, or you can upload a custom theme that you’ve found elsewhere, like at ThemeForest. Plus, both WordPresses let you customize your site via plugins. You can get ecommerce plugins, for example, to create an online store on your website. Or you can get various communication plugins to enable live chat with your customers. WordPress.org does offer more customization in the back end. As we discussed above, it allows you to choose everything from the version of WordPress you run to your host. But those won’t really affect the way your website actually looks. When it comes to the front end, both WordPresses allow for impressive customization. Pretty much everyone loves both WordPress.org and WordPress.com, as even a cursory internet search will tell you. When we asked small-business owners about their favorite website builders, more than half told us that WordPress is their platform of choice. Most of them didn’t differentiate between WordPress.org and WordPress.com, but many of their reviews could apply equally well to either. So whichever WordPress you choose, you’ll be in great hands. When it comes down to it, both WordPress.com and WordPress.org are great website builders that offer tons of plugins and themes, meaning you can personalize your site to your heart’s content. As a paid web host plus builder, WordPress.com offers a little more convenience, while the open-source WordPress.org offers a little more customizability. We ultimately recommend WordPress.com to most small-business owners. That’s because most of WordPress.org’s benefits come from back-end customization. And frankly, many small-business owners don’t have the technical expertise necessary to make the most of those features. 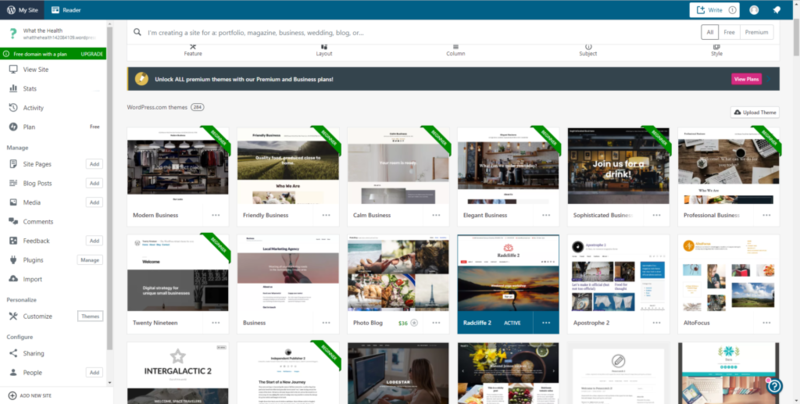 WordPress.com’s convenience makes it the better WordPress for small-business owners who want to build their own websites. And you’ve used either WordPress, we’d love to hear your thoughts. Tell us about your experience in the comments below! Not sure you want either WordPress? Check out our ranking of the best website builders to get some alternatives! Previous Article Squarespace vs. WordPress: Which Is Best for Businesses? Next Article Weebly vs. WordPress: Which Is Better?